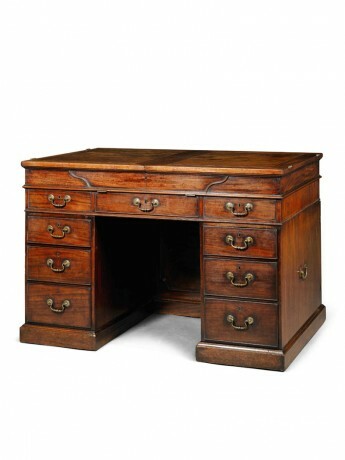 Unusual mahogany desk attributed to Thomas Chippendale, the rectangular top enclosed by a pair of hinged panels which fold out to rest against the sides, and a shaped section at the front which folds down, the interior with the original faded green baize lining, the central reading flap with detachable reading slide, the front of the desk with three drawers in the frieze and three graduated drawers to each pedestal, all with their original brass swan-neck handles, the knee-hole with a mahogany panel towards the back, the reverse with a pair of panelled cupboard doors enclosing, on one side, twelve pigeon-holes with distinctive over-lapping double circular boxwood alphabetical labels, and folio divisions on the other, on a moulded plinth base, each pedestal with two, centrally-mounted large brass triple-wheel castors. Circa 1760. The most unusual form of the top of this desk appears to have only one other counterpart, an unprovenanced library table illustrated in Ralph Edwards and Percy Macquoid, The Dictionary of English Furniture,(1) which has just the same configuration of folding top panels and shaped fall-front section in the frieze. 1. Ralph Edwards and Percy Macquoid, The Dictionary of English Furniture, 1954, Rev. ed., Vol. III, p. 256, fig. 37. 2. See Christopher Gilbert, The Life and works of Thomas Chippendale, 1978, Vol. II, fig. 266, p. 147, and fig. 442, p. 242. 3. Christie’s London, Dumfries House, Vol. I, 12th July 2007, lot 30 (this is the catalogue for the Dumfries House auction which did not take place); see also, Gilbert, op. cit., Vol. II, figs. 431 and 432, p. 236, and Vol. I, pp. 133 and 138. 4. ‘strong triple wheel castors’ (Dumfries desk); 'Brass castor with triple wheel friction rollers' (Harewood library table), as described by Gilbert, op. cit., Vol. II, p. 147. 5. See Christie's London, Simon Sainsbury, The Creation of an English Arcadia, Vol. I, 18th June 2008, lot 145, ‘A George II library desk attributed to Thomas Chippendale’:- “Most tellingly - and apparently unique to Chippendale - is the positioning of the castors beneath the centre of each pedestal. This distinctive treatment is shared with the library table supplied to the 5th Earl of Dumfries on 29th May 1759 … These same ‘triple-wheel’ type of castors were also used by Chippendale on the Harewood library table made in 1771. In all of these instances they are paired and centrally located beneath the pedestals”. 6. Sotheby's New York, Important English Furniture, Silver & Carpets from HSBC's Corporate Art Collection, 21st October 2004, lots 34 ($1,800,000) and 31 ($299,200). 7. Gilbert, op. cit., Vol. II, figs.245 and 248, pp. 136 and 138. 8. 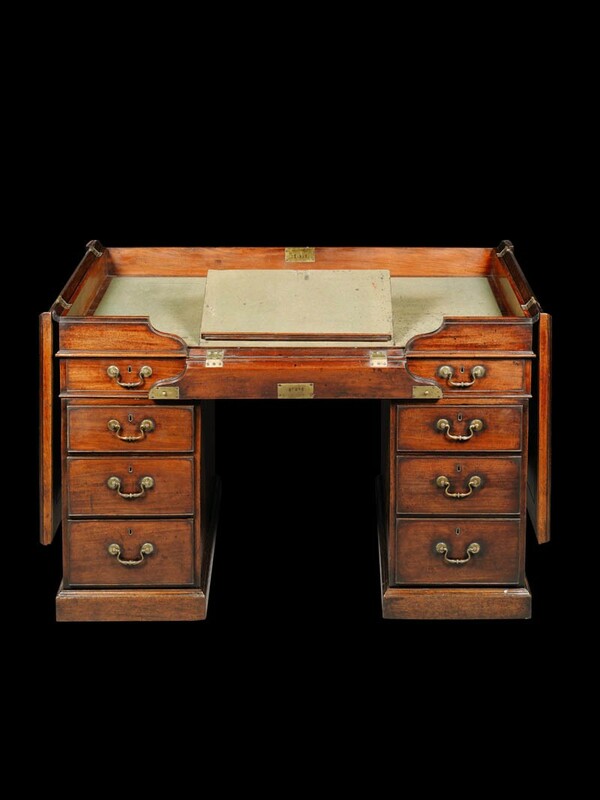 For example, on a pair of card tables supplied to Dumfries House, ‘lined wt. superfine green cloth’ (Gilbert, op. cit., Vol. I, p. 138); on a ‘Mahogany Buroe’ for Burton Constable Hall, Yorkshire, ‘the fall lined with Green Cloath’ (Gilbert, op. cit., Vol. I, p. 279); and on a library table supplied to Sir Lawrence Dundas in 1765, 'the top coverd with superfine green cloth' (Gilbert, op. cit., Vol. I, p. 160). 9. 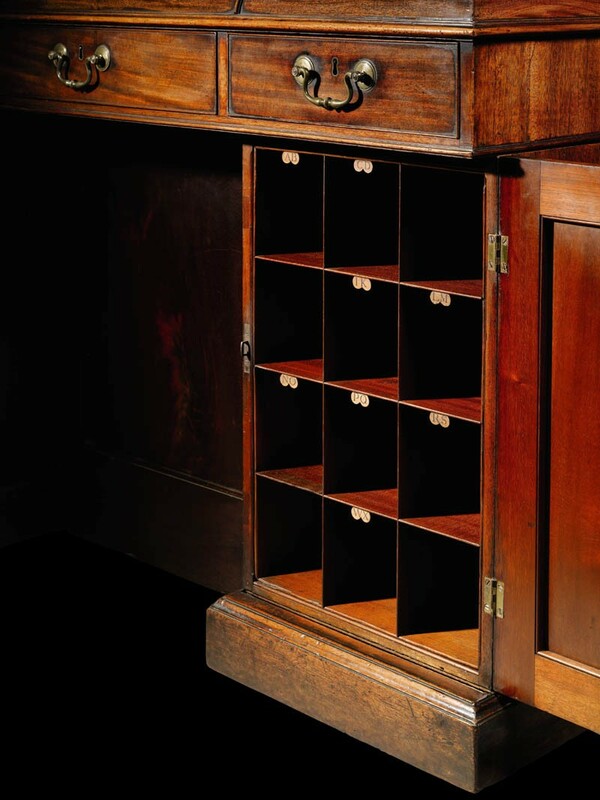 Christie's London, Exceptional Furniture, 18th June 2008, lot 12.